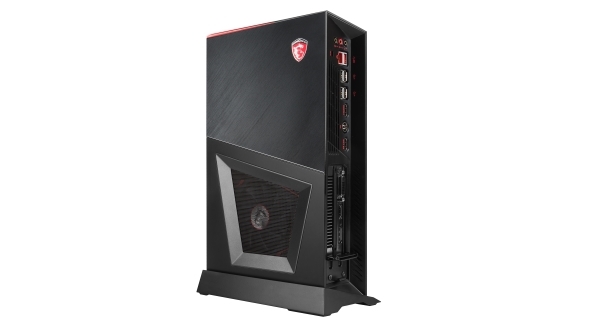 A small form-factor gaming PC really can be as capable as its larger siblings, as MSI have proven with their Trident 3. This console-sized machine is more than capable for its size, offering a great gaming experience at low noise, and isn’t full of proprietary parts that will end the upgrade life of your PC prematurely. Longing for a more laid-back PC gaming experience? Here are our picks for the best PC controller. With the Trident 3, MSI have not shied away from a PC gamer’s need to tinker with their systems. While you will need to grab a screwdriver and drive it straight through that ‘warranty void if removed’ sticker, all the parts within the Trident 3 are entirely standard. Of course, there are some limitations to your modding. You won’t be able to throw in a Titan Xp without some serious changes to both the chassis and PSU – if you are looking to do that, I don’t think this console-esque PC is for you. The Trident 3 makes use of mini-ITX graphics cards and while we only had a mini-ITX GTX 1050 Ti to hand, this completely standard PCB design fits without issue. What this represents is the rare opportunity, when it comes to small form factor (SFF) pre-builts, to keep upgrading your graphics card down the line. 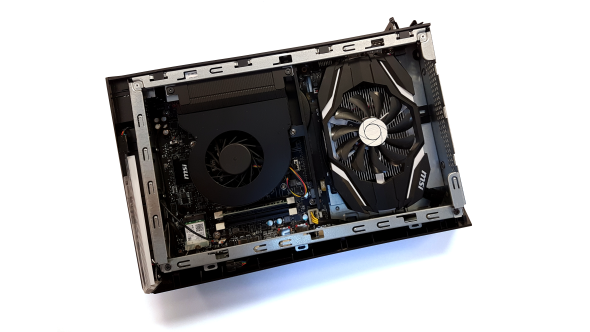 Mini-ITX graphics cards seem to be gaining popularity among builders and manufacturers alike, so a choice of cards shouldn’t be an issue once third-party cooler designs start arriving on the scene. Our Trident 3 model was £1,200 at launch, however, these particular specs are no longer available. 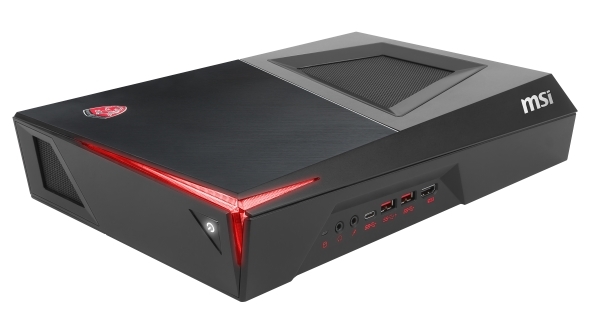 MSI now only have two models available in the UK – the i5-7400, and the i7-7700, both with GTX 1060 3GB cards, and priced at £1,100 and £1,300 respectively. On the CPU side, it’s a regular LGA-1151 socket, although the i7 model will provide plenty enough processing power for some time. Not that Kaby Lake has much of an upgrade path now anyways. On the i5 model, you could always upgrade down the line to an i7, which could provide quite a boost. Temperatures never reached more than 80° Celsius on the graphics card, even at peak gaming demand. The single-fan graphics card does a valiant job keeping temps in check, and it’s not particularly noisy either. I struggled to hear the machine at all over the hubbub of our office. The CPU does run a little hotter, with an idle temp of 43°C, which is a little out of my comfort zone for any personal PC builds. At peak usage during benchmarking, the CPU reached 87°C, a little on the hot side. Just as I went to set this machine up, utilising the VR passthrough port on the front, I stumbled across the biggest flaw I found with the Trident 3. Modern TVs tend to utilise HDMI almost exclusively these days, however, so do both the Oculus Rift and HTC Vive straight out of the box. Due to the single HDMI port on the graphics card, I was stuck searching desperately for a DVI to HDMI adapter to connect VR, as my TV already occupied the single HDMI port. Luckily, I had the adapters required nearby, either DisplayPort or DVI will do, but this could be an issue for someone who wants to get straight to VR gaming without all the hassle. The lack of proprietary parts allows some wiggle room in the next few generations of components, which is not something found often with pre-built SFF PCs. 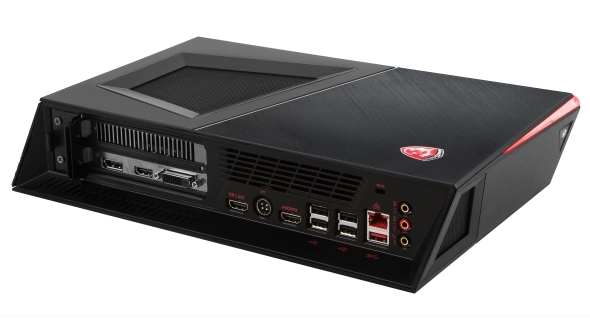 For the amount of connectivity and features packed in the console-sized Trident 3 chassis, it’s quite the accomplishment by MSI to keep parts standard. The Trident 3 offers a full-size gaming experience in a little package, and it achieves this while using standardised parts. With plenty of connectivity, and despite the annoying bloatware… defiantly, the MSI Trident 3 shows everyone that you can make a console for PC gamers, without removing everything PC gamers love.